Fr. 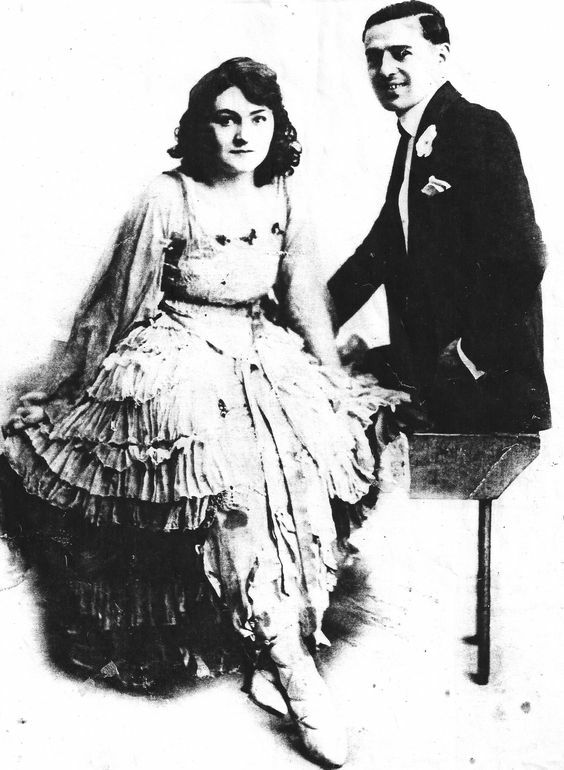 Lloyd’s parents, Helen and Morris, performed as a duo under the name Lloyd and Ardle. My mother, Helen – the eighth child of Edward McArdle, an Irish pubkeeper and his Jersey City wife, Mary – was born in Hell’s Kitchen, on the notorious West side of Manhattan Island. In a neighborhood saturated with poverty, brawls, riots, knifings, sassy wisecracks and endless street smarts, she, at the age of five, began to sing for adults, and quickly received the affirmation such coquettish behavior produced. 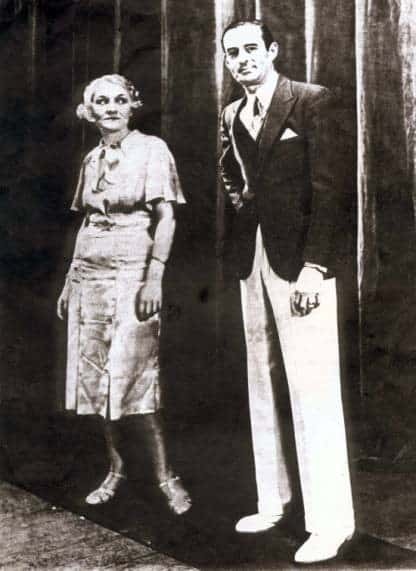 She was also Nellie, her father’s idol and the “apple of his eye.” She became used to the limelight of attention and affection, and although he died when she was seven years old, her early-formed sense of self easily led her into the world of the theatre. She was so successful in developing a pleasing and attractive stage style that she left school at the age of 12 to join a touring group of child singers in a bygone form of American entertainment called vaudeville – which, then, enveloped the country in much the way that television is a vital part of our modern culture. Her salary was sent to New York to support her now-widowed mother who had been left truly penniless on the death of her husband; his assets, she was told by experts, had been immediately absorbed by what they called “expenses.” The pub was gone as well as the flat in which they all lived at 52nd Street and 10th Avenue. There was no widow’s pension. No social security. No government aid to which she could appeal for help. There was only the “Gerry Society” which theoretically rescued abandoned children from the streets of New York – but which, in fact, was a gruesome custody. Horror stories about the rescued kids were told around the pot-bellied kitchen stove, the only source of heat in those frigid New York winters. The “Gerry” was considered the acme of abandonment. So, her mother, Mary, the Irish-American beauty from New Jersey, opted to keep all her children (seven still living at that time) contrary to the advice of the “sensible” ones around her. She scrubbed floors for ONE dollar a day! She scrounged and saved and “made do” with amazing versatility and adaptability. They lived in cellars and one-room flats. They were bounced from the proverbial pillar to post. The kids slept anywhere, often on the floor. My Aunt Maggie – who later achieved real scholarship at Columbia University with her outstanding master’s degree in political science – at one time, had to sleep on TOP of a battered old piano. The kids often went to bed hungry and to school without lunch. They learned very early to “put up with things” and to make the most of what life offers. Under such real poverty – which makes modern descriptions of “being poor” look frivolous – mother and children huddled together, frightened and suspicious of the “outside” world. Nevertheless, they did survive and surprisingly so, even though none (except Maggie) had any kind of education or training in anything. They all learned something – be it photography, auto mechanics, cooking, domestic housework, singing, postal work. All made their own way! They confronted life with almost peasant Irish guts. There was no help or encouragement from teachers or mentors or social workers. Only guts and some kind of primitive faith in God which they inherited from their simple mother and no-nonsense father. So, my mother learned “show business” the hard way: just by doing it. By failing and falling, but by sticking with it, she became very good at what she did. She was pretty, personable and flirtatious. She sang for President Woodrow Wilson in the White House, wowing him with her rendition of “Saloon, Saloon, Saloon.” She developed a singing style which absolutely flirted with the audience. We were told that when she sang “Danny Boy” she would have the whole theatre in tears. When she was 15 years of age, she had snared a handsome Jewish tap dancer named Morris Rosenbloom. By the time she was 22 years old, she had two children, a girl, Maurica and a boy, James (me!). Fr. 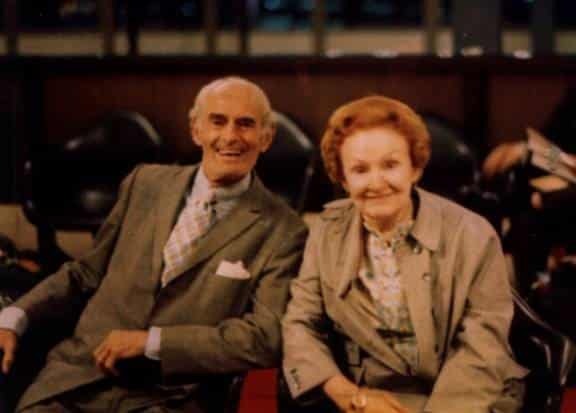 Lloyd’s parents, Helen and Morris, performing as Lloyd and Ardell. My parents became a duo: Lloyd and Ardell (derived from McArdle). They sang, danced, joked, did skits, pratfalls and covered what we called the “whole schmear.” They even did a bit of Shakespeare. Pop was now known as Morris LLOYD, since the anti-Semitism of the time was a serious obstacle to a successful career in the theatre. We all tried to hide it (our Jewishness) and we kids pretended that we were Goy or Gentile or even white!! 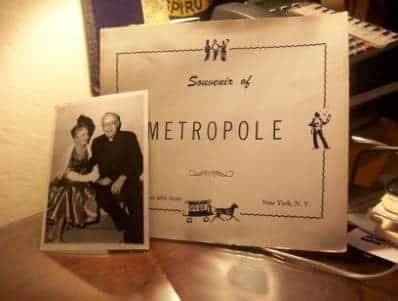 We toured with them on the Keith’s Circuit playing mostly the one-horse towns which probably explains my unmitigated sarcasm for places like Bridgeport and New Haven! We stayed in fleabag hotels and ate survival food at the automat. Clearly, their professional reputation improved as they finally played the all-high Mecca of vaudeville, the Palace on Broadway. Yet, there were joints they played. There were backwater eyesores where they did four or five shows a day. There were nightclubs and one-night stands for special occasions. They became the stereotypic vaudevillians hating the arrival of the monstrous successor, the movie! But they loved their life. The train rides and the new audiences and the freedom to be who they really were – even with the illusion of the theatre – were sheer delight to them. Pop called Mom “Mick” since she had a fierce, unforgiving supposedly Irish temper and became insanely jealous, and often volcanic, if he dared even a quick look of appreciation at some of the shapely chorus girls who were all over the backstage in scanty and eye-catching costumes. Often, Mom would take me out on the stage after her own gig to do a little fake buck ‘n wing to the wild applause of the audience. I hated it! But I had to do it! She conceived what she thought to be a brilliant show biz bit. She and Pop would do a classy Argentinean tango in authentic gaucho garb. Then my sister and I would follow with a miniature version similarly garbed but as a parody. The audience went wild every time. Again, I hated it but had to do it. So, when the well-meaning nerdy stage hands would ask me, a six-year-old, if I intended to be an actor, I quickly learned to spit out a well-articulated and ferocious NO!!!! My mother had an unbelievable memory, having committed 2,500 songs to her inner computer. Part of their act was for my father to solicit requests from the audience challenging anyone to stump her. Few ever did and, in time, she showed up in Bob Ripley’s famous BELIEVE IT OR NOT newspaper feature. It was preserved as a large poster of which she and all of us were extremely proud. 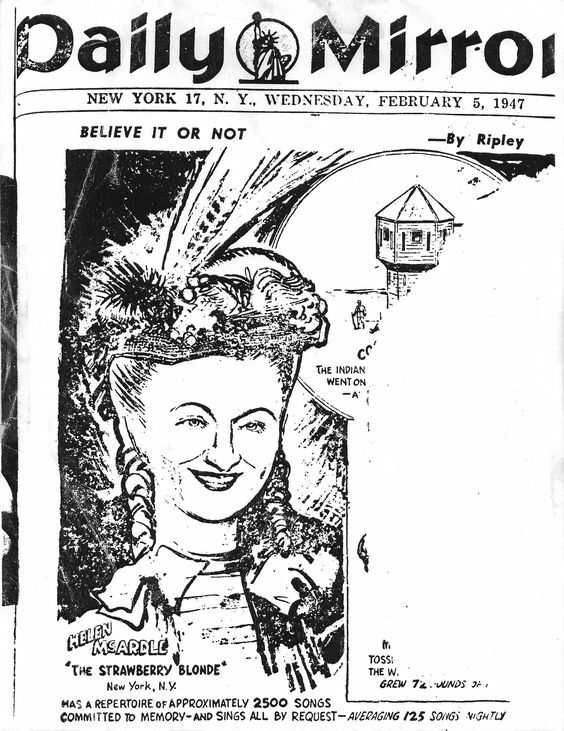 Helen as featured in the New York Daily Mirror in 1947. She was called the “Strawberry Blonde” ever since her early career days. But this title became fixed when she opened at the Metropole, a money-making gin mill on 47th Street and Seventh Avenue where she sang and joked for 11 years. 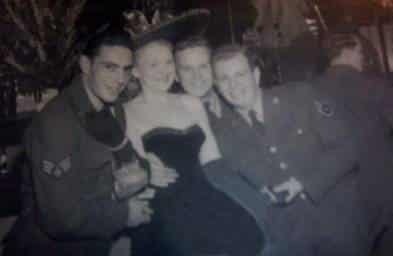 During the War and postwar years, she was a great favorite with service men, of all branches, as they came to “whoop it up” on their leave time. Most of them were kids from the farms and the South who were entranced with the big city and with the lady who smiled and laughed with them and sang catchy tunes, as she hid her real age and came across as a youngish Broadway star!!! Little did they know that she had a married daughter with a child or that she had a newly ordained priest as a son! Her early need for recognition stayed with her all her life. She was admired and loved by many. While her need for some kind of attention was very powerful, she used it with great skill to bring joy and delight to multitudes! For a woman whose education reached only to the sixth grade in a parochial grammar school, she was extraordinarily effective and successful. Not only did she hone her craft as an actress and singer, but she developed an interpersonal skill adequate enough to meet politicians, millionaires, high-ranking clergy, anyone, with ease and confidence. She left THEM wishing for more. When she was an old woman, a high-level clergyman remarked to me that he bet “that guy Lloyd must have been eager to come home every night.” It was amusing to me to see the big-talking money men gravitate to my mother even when her daughter (who was physically beautiful but somewhat retiring) was by her side! Few women could compete with her when males were in her vicinity. When she was 80, she performed at a Nostalgia Night at Iona College in New Rochelle. I, as director of the graduate division of pastoral counseling, was running a fundraising campaign and invited her to entertain the college community. She accepted in a flash, donned her Gay Nineties costume and utterly captivated the egghead intellectuals with her Irish classics, her unabashed Americanism and even her famous rendition of “Yiddishe Mama,” which overwhelmed the Jewish contingent! When she died, in accord with her view of life, I tried to make her funeral Mass at her beloved Paulist Fathers’ church in New York a celebration or party. Her colleague and friend, Tommy Furtado, himself a noted Gotham nightclub singer, sang an original and beautiful rendition of “Bill Bailey.” For the recessional hymn, the choir sang “When the Saints Come Marching In.” We had refreshments at the entrance to the Church with the casket right there! Bizarre? This was her style – laughing at life and death – with a simple uncomplicated faith in Christ and the Blessed Mother, utterly sure that she was loved and appreciated by everyone she met. Her belief that she would see the Lord and the Saints and her family and friends in heaven was unquestioned. For a poor kid from Hell’s Kitchen she did a great job of handling life. At least, I think so; but, of course, I am a bit biased. How many guys can boast of an Irish mother who married a Russian Jew and could sing Yiddish songs to college professors, but finished only the sixth grade? Paulist Fr. James Lloyd, age 96, is the oldest-living Paulist Father. He resides at the Paulist Fathers Motherhouse on West 59th Street in New York City, just blocks from where he grew up on Manhattan’s West Side. He holds a Ph.D. in psychology from New York University.